Beauty and the Beast. Little Shop of Horrors. The Little Mermaid. 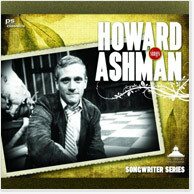 Grammy, Golden Globe and Academy Award-winner Howard Ashman wrote the lyrics for some of the stage and screen's best-loved scores before his untimely death in 1991. This new volume of PS Classics' celebrated Songwriter Series, drawn primarily from private demo recordings, features Ashman singing selections from all these scores, as well as songs from lesser-known shows like God Bless You, Mr. Rosewater and from unproduced works. A bonus CD includes a true rarity: the complete demos – 15 tracks – from Ashman's 1986 collaboration with Marvin Hamlisch, the Broadway musical Smile. This two-CD set captures the diverse and memorable accomplishments of one of the true geniuses of the contemporary American musical theatre. In late 1985, Hamlisch and Ashman met with Bob Fosse after a workshop performance of Smile to try and interest him in the project. Ashman's tape of that meeting survives, and it offers a rare look at three musical theatre luminaries discussing the strengths and weaknesses of a major work in progress.